I see a gender issue. There have been serious clashes worldwide over this anti-Islamic movie, that by most accounts, is of bad quality and is now notorious and has been made VERY important – because all those protesting have ‘blessed’ it with that honour. The thing that I simply can’t fathom, from a humanitarian point of view, is why these protesters have placed SUCH significance and attention on something that could have quite as easily gone through undetected. All of this for WHAT? Wanting to change how people think? Do they think violence is the way to change people’s minds? We all seem to be on the same page about the obvious feelings that the Sydney protest (that turned violent) has stirred. Despite living in a huge melting pot, most people have been positively forging connections with other cultures. This last weekend’s events, however, have set this back substantially – giving those less tolerant the fuel they need to validate their feelings of racial hatred. As I watched (stunned), I found myself disconnecting to what was being said – pressed mute, if you will – and just observed the images before me. And I saw a sea of men. Men inciting violence. Of course, there were women in the mix, but for the most part, you must agree that the reaction is a masculine one. Heated and violent. 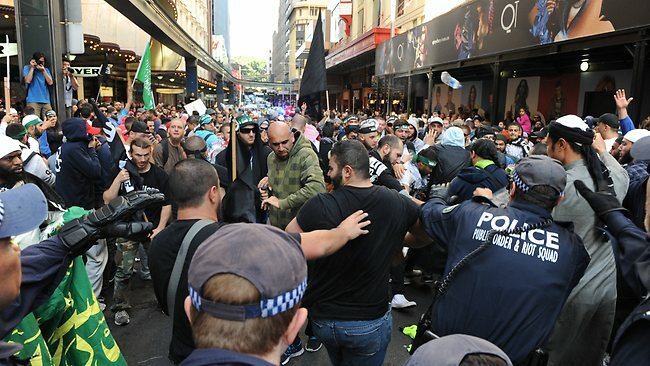 I found it interesting that the one person in the Sydney riots who received the most singular attention, was a woman. A mother who was photographed taking a picture of her child with a placard calling for the beheading of those who insult the prophet Mohammed (one copy of a gazillion of the same placard). The part that intrigued me, however, is that this woman handed herself in to Police the next day, to sort things out. Any of the men do the same? The violent and destructive ones? Remember that I’m observing – like a David Attenborough from another planet – having a peek. So, I looked at what was happening around the world – and yes, it’s more of the same. 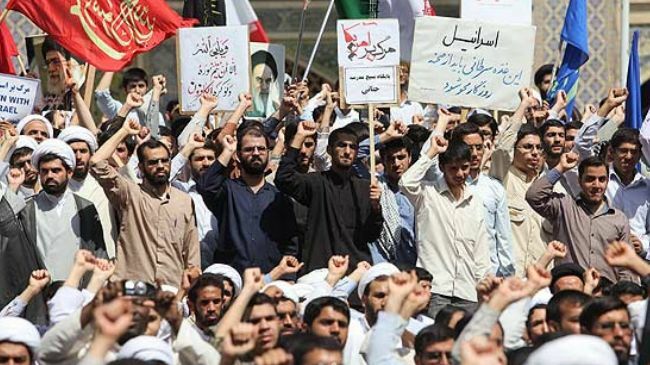 “This insult touched off the second wave of Islamic awakening and we hope that this wave would grow into a tsunami which would annihilate the US,” Ayatollah Ahmad Khatami, the top member of the Assembly of Experts, told thousands of clerics in the holy city of Qom on Sunday. Question #98: Can we ever achieve a peaceful existence, when the predominant masculine reaction is paving the way? I’m not implying that ALL men are this way – in the same way that I would never profess that women are incapable of violent acts. 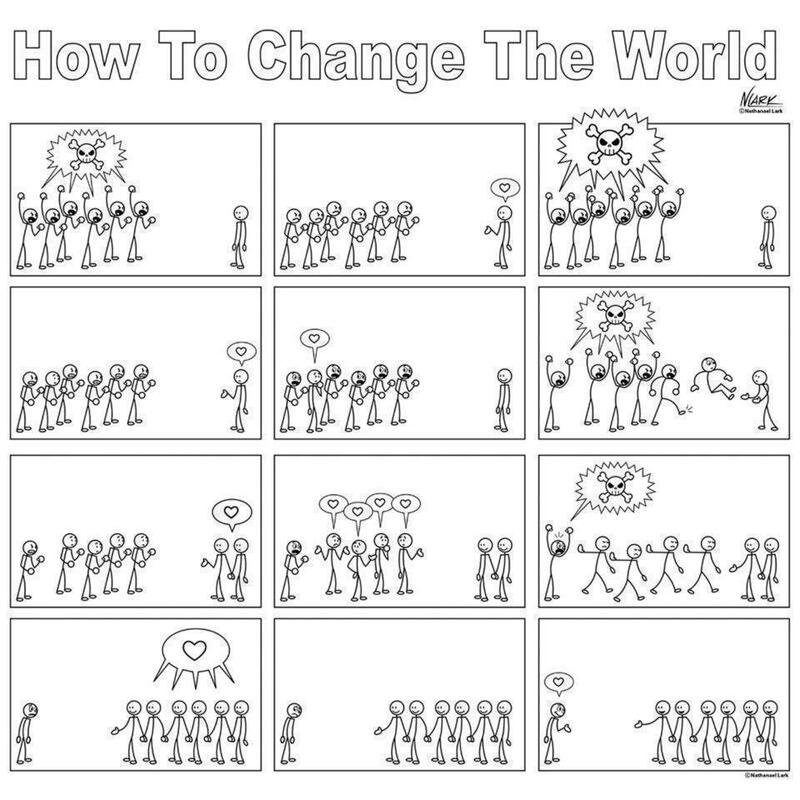 Maybe I’m naive, but I like the cartoon.